What does it mean for women’s rights that most online platforms and services are owned by a few transnational corporations? How do international copyright agreements, data protection and privacy affect our advocacy? Who governs the Internet, content and data we produce and exchange, and how can feminists engage with and participate in this process? An article by genderit.org of the issues raised in the economic toolbox session “Commodification of Knowledge – How increasing access and availability of the Internet has transformed the way knowledge is produced and shared” at the 2012 AWID Forum is included below. The session, organised by APC, brought together speakers to spark debate and reflection, but the audience vibrated with insights and was full of feminists eager to deepen discussion on the commodification of knowledge. Natasha Primo shared research findings from APC on piracy in South Africa. Now, depending on what country you are from and your cultural background, the word piracy and admitting to engaging in it can evoke gasps and looks akin to what you get when you admit to engaging in some unseemingly practice such as sharing needles or a felony crime like armed robbery (and in some countries piracy is a felony!). But Natasha presented the issue in a very matter-of-fact way – after all ideas about piracy and intellectual property are culturally and colonially imposed and South Africa is an excellent example. Under apartheid, “Illegal copying because of book bans and government censorship became an act of political resistance as it was the only way to circulate dissident points of view.”. 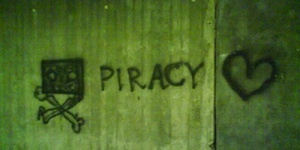 There is indeed an anti-piracy fever, very linked to the adoration of the market economy. Natasha observed that countries that do not comply with stricti copyrighti legislation, are subject to development aid cuts – definitely something to monitor. But the research found that enforcement not only focuses on the most vulnerable pins in the piracy machinery (such as women street vendors, I bet) and doesn’t actually change piracy patterns. Why? Because factors like poverty, the globalisation of media culture and cheap internet accessi intervene. Creative commonsi and copy-left concepts of share and share alike are the anti-christ to the market economy. Why are IP crusaders so unwilling to make exceptions that take into consideration the different economies that make up our planet, and make goods available at reasonable prices – be they academic journals or the latest music. Not to mention their disregard for basic human rightsi of access to knowledgei, ie universal accessi for reading materials for the blind. My role was to take a look from a user perspective at Google, Facebook, Twitter – companies who have excellent free services upon which all of us are increasingly dependent. Even Google’s investment in free and open source Android operating system for mobiles has meant they keep an edge in our increasingly mobile world – making sure there is a direct line to Google services even when you are on the go. Billioni-dollar incomes are generated almost entirely from advertising, from the sale of …. us, mining data that we so happily provide with every quiz we fill out and game we play and friend we tag, using fiercely sophisticated algorhythms and intense data crunching. What does it mean when feminist movements abandon their websites and focus all communication through Facebook – the very-same site known to ban images and information alluding to lesbian sexuality, abortion, and breastfeeding? Jac sm Kee encouraged us to have no illusions, just take a look at the Google transparency report – Google is clear that if asked by a government for our data, it will hand it over. And with such hefty economic power and influence – such companies can negotiate with countries, change services accordingly, they can make or break legislation, or buy whole datasets of nations. Jac, having taken a look at the historical commodification of knowledge pre-dating the printing press, asked us, what makes the interneti different? From oral histories onwards data has been commodified, copyrights and access to data controlled. The internet’s open architecture, that it doesn’t “belong” to anyone, that it is based on many-to-many and allows you to create identical data with little effort – this is all a big threat to industry, which is based upon the commodification of any exchange. So we get this great platform for sharing knowledge and now companies and governments alike are all scrambling to regulate it. Which is of course why the internet, and internet governance is such a vitally important feminist issue. This kept reverberating in my head with every stateiment, every experience shared at this session and in other sessions – from Women on Waves talking about the direct and crowd-sourced censorship that they face at every turn on Facebook, Youtube, Google search, when they try to do awareness-raising and capacity-buildingi around abortion; Nadine Moawad sharing how the word Palestine disappeared from Facebook; when the Wikipedia Foundation rep bemoaned the 90% dominance of male editors; when alerts about new SOPAs on the stove or PIPAs in legislative pipelines came out… Internet can’t be up for grabs in a bargain basement sale, nor can our histories, nor our movements. Click here to read “Internet & women’s rights: how do they relate to economic justice?”… a collection of post 2012 AWID Forum reflections from genderIT.org. Click here to read the genderIT.org SPECIAL EDITION: 12th AWID International Forum on Women’s Rights in Development coverage. Photo by ToobyDoo. Used with permission under Creative Commons License 2.0. Why is the Internet a Feminist Issue?